You are currently browsing the tag archive for the ‘green canopy’ tag. Corner of Canterbury Road and Herbert Street Dulwich Hill – an unusual opportunity by Council to make a truly green and inviting space for the community in this location. A missed opportunity and I bet this work cost a lot. A while ago a reader wrote & asked what I thought of the NSW government’s plan to plant 5-million new trees across Sydney by 2030. I was surprised that I had missed such a great commitment from the government & pleased that finally, something was happening to address Sydney’s canopy. The issue is back in the news today, so I thought I would write about it for the people like me who missed this news. Climate change is coming with a vengeance. You just have to feel today’s temperature at a record-breaking 35-degrees for the third time this week in mid-Autumn to know something is going on & every year it gets hotter. Even the trees are getting confused putting on a second flowering when they are supposed to be shedding their leaves. The ‘Five Million Trees’ initiative will cost $37.5-million over four years & will increase Sydney’s existing tree canopy from 16.8% to 40% over the next 12-years. The former Marrickville LGA’s canopy was documented as “poor” by 202020 Vision at 16.3%. Leichardt LGA was documented as 20.3%, & Ashfield as 19.8%. You just have to cross Parramatta Road to Leichhardt & Annandale to see a massive difference in the canopy compared to Marrickville, Tempe, Sydenham & St Peters. The suburbs of Petersham, Camperdown & Stanmore fare much better & to my mind, have a much nicer streetscape because of the street trees. Even then, the comparison to streetscapes in the former Leichhardt LGA makes these suburbs look tree poor. Dulwich Hill is somewhere in the middle depending on where you are. Taking our canopy from 16.3% to 40% by 2030 will mean a substantial increase in livability for residents, though I do have concerns about how this will be managed with the coming over-development for Marrickville & Dulwich Hill. Development generally means losing mature trees & token trees as a replacement. Let’s hope the government forces developers to leave space for big canopy trees & not take the route of removing trees in one place & saying it is okay to plant trees somewhere else. This is a terribly poor result for the community & especially wildlife. This would be a good time to force developers to set their high-rise buildings back 4-5 metres to allow trees to be planted at the street front instead of building right to the footpath. Trees in the front of set-back buildings could look so much better & be much healthier for the residents of these buildings. I would be happy to give developers extra height to allow space at the front for trees & to avoid the tunnel effect of overbearing buildings. 380,000 trees will need to be planted by local councils across Sydney every year for 12-years to achieve the target & to minimize the urban heat island effect. I would love to know how many new trees Inner West Council will need to plant every year to meet this target. The improved canopy cover is expected to reduce temperatures when the sun is at its hottest by approximately 5-degrees Celsius. That doesn’t sound much, but stand under a shady tree on a hot summer’s day & you will instantly notice how much cooler & pleasant this is. We will have people being neighbourly again & not trapped inside with the air-conditioning. This will be a good thing for community relations. In 2017 the Inner West Council said they planted 1,000 trees across the municipality. While I am pleased for any new tree planted, I thought that was a low number for what was, until recently, three municipalities. They did not say where the trees were planted, so we have no idea whether each former municipality got one-third each or Balmain & Leichhardt lucked out with the largest number of new trees planted. Who knows? You can’t blame anyone for wondering these things when there is poor information given. I estimate that the Inner West Council will be required to plant more than three times that number every year from now on. Perhaps, this will encourage council to include the community in tree planting, as happens elsewhere across the globe. If the residents help plant the trees, there is a lesser chance that these will be vandalized. The community will come to understand why trees are necessary & how these new street trees will improve their quality of life, their health, the value of their home & lessen their power bills. You just have to see the work done by Blacktown City Council’s Cool Streets project to see how their community went from choosing small stature street trees to choosing a mixture of medium to tall trees. They made the huge change because they learnt about the benefits to their health & their wallet. Of course, there is always a chance of a roaming vandal, but hopefully, these people get caught up in the tree education and decide to vandalise inanimate objects (or their own home) instead of public trees. The NSW government also plans to give away 15,000 trees to people who are building homes in new land release areas in Western Sydney. This is a very good thing, but I wonder where they will find space to plant them. Having seen new estates, the blocks are almost all covered by the building’s footprint. There also needs to be means to check that these trees have actually been planted. The ‘Five Million Trees’ initiative is part of the NSW Government’s Open Spaces package at a cost of $290 million. $20-million will be to build & renovate up to 200 playgrounds. $30-million will be to create 81 school ovals & playgrounds for public use during school holidays. I have concerns about using playgrounds as public green space. I may write about this on another occasion. Marrickville streetscape. There was more concrete behind me. 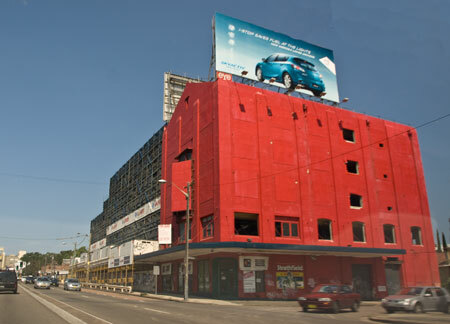 Bushpocket site in Ruby Street Marrickville. This is a photo from 2012. I have not seen the new planting work yet. Councillor Sylvie Ellsmore asked the following Question on Notice – Tree planting, canopy & Street Tree Masterplan at the Council Meeting of 25 June 2013. Bold is Clr Ellsmore’s questions. Council’s answers are below. Any response from me is in italics & in square brackets. 1. How many trees are scheduled to be planted in the 2013 planting period & how many were planted in the 2012 annual planting period? 2. How many trees has Council planted in the current planting period, to date? 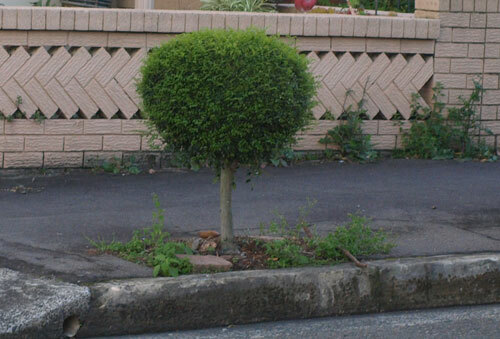 The total number of street trees planted in the 2013 period (1st January – 1st June 2013) is 71. 3. What percentage of these plants are native species & what percentage are semi-mature trees as opposed to saplings? Within the current 2013 planting 80% are native. All plantings are 45 litres or greater. [Winter Hill Tree Farm provide the following information about 45 litre trees – 45-litre pot or bag, 15-25mm calliper, height 1.5 – 2 metre height, spread 0.6 – 1metre. 4. Will Council achieve the planned number of plantings in the 2013 planting period? (include details of targets). Yes, 320 trees to be planted before end of July 2013. 5. Will Council undertake any Capital Tree Planting in 2013 & if so, where? Yes, Enmore Park & Petersham Park. Cavendish Street Enmore: an in-road planting with expanded soil volumes utilizing structural soil systems. Other tree planting opportunities are explored as part of Infrastructure Capital Design. There is a budget of $80,000 in 2012/13 & a further $40,000 in 2013/14. 8. What work has been undergone, to date, to develop the Marrickville Street Tree Master Plan, in line with Council’s Urban Forest Strategy? Does this include the development a brief to engage a consultant to develop the plan, and what is the timeline for such a brief to be completed? A Brief has been developed, quotation process undertaken & a consultant engaged. The first meeting of the project control group was on 12 April. A plan for adoption by Council is currently expected in March 2014. 9. 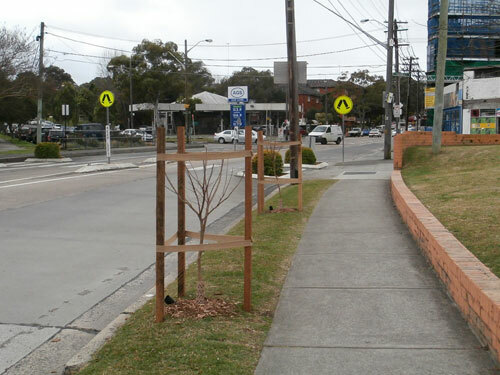 What steps have been taken to increase the tree canopy in Marrickville in the 2013 annual tree planting period? (including number of new trees, maintenance of existing trees, selection of particular species for current or projected canopy size). See above numbers for trees planted. [Council have planted 71 new trees by 25 June 2013]. Council has not measured the urban forest canopy size or made any specific recommendation about the amount of canopy increase it is seeking. 10. What is the planned percentage increase for the urban tree canopy this year? There are currently no systems in place to measure canopy area. 11. How many native plants have been given away to the community to date in the 2012/13 period? To the end of May 2012, there have been 1,716 plants freely distributed by the Community Nursery to schools, childcare centres, community oranisations, neighbourhood action groups like Thornley Street Weeds Group & residents redeeming vouchers distributed in Marrickville Matters. Through Council’s Sustainable Street program there have been 536 plants given away to residents as part of the installation of verge gardens. The combined total is 2,252 plants. 12. What is the target for native plant giveaways & will Council reach its target this year? In Council’s 2012/13 operational plan the target is 2,700 plants given away. The target should be reached. 13. What is the status of Council’s bush pockets in terms of ongoing maintenance? 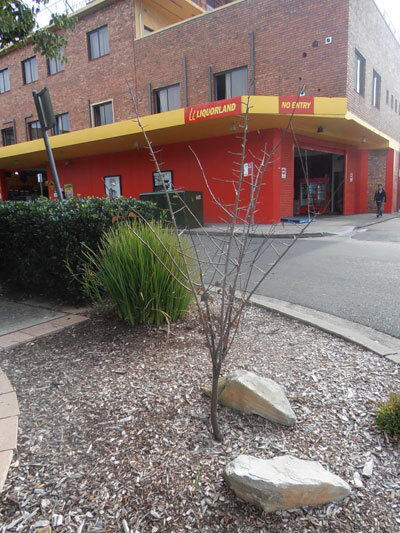 Parks & Streetscape gardening staff maintain 3 bush pockets sites on a monthly cycle frequency. The Ruby Street community have been active in planting & weeding the small (unnamed) bush pocket park underneath the remnant fig tree with quarterly working bees. These are supervised & resourced by Council staff with plants accessed through the community nursery. Lawn areas are mowed by Council’s streetscapes crew, some reduction in lawn area has recently occurred with new perimeter plantings. 14. Are the plans for any more bush pockets in the LGA? The community can nominate suitable areas for bush pockets & these can be assessed partly on the willingness of locals to participate in its long term care. The area on Beauchamp Street adjacent to the golf course may be developed as a bush pocket in the future, but is contingent on funding for weed tree removal (see Biodiversity Officer for more information). 15. What is the annual operating budget allocation for maintenance of trees on council lands in the 2012/13 financial year? Has there been a review of the adequacy of the current allocation? (provide details). Street Tree Inventory identified priority tree maintenance works. Additional capital funds provided in 2013/14 draft budget to accelerate high priority removals & replacement. 16. Can council supply figures on contract tree maintenance or bush regeneration for the 2012-2013 financial year with a break down that shows: tree pruning, tree removal & bush regeneration (including sites). $30,000 planned expenditure for vegetation at Marrickville Golf Course, Cooks River Foreshore (‘Wave Rock’) in July-August in coordination with National Tree Day. Other figures not attainable within timeframe given for response. 17. Has Council progressed any long term training in horticulture, conservation & land management for Council outdoor staff in the 2012.13 period? (provide details). Thirteen staff from Parks & Streetscape including Supervisors & Team Leaders successfully completed the Conservation & Land Management Certificate course in 2012. This 12 month course was provided by the Northern Sydney Institute of TAFE at the depot worksite & included a number of practical workshops at bush pocket sites within Marrickville municipality. Parks & Streetscape staff have also undertaken formal training in Erosion & Sediment Control. Working Around Trees & Tree Roots, Native Plant Identification, Chemical Handling & Chemical Risk Management. Marrickville Landcare site – Bush regeneration contract work supplementary to monthly volunteer x 2 months $1,600. Camperdown Cemetery – Bush regeneration contract work supplementary to monthly volunteer x 2 months $1,600. Cooks River Valley Garden – Monthly bush regeneration contract work x 12 months – approx $7,000. 18. Are Council outdoor staff participating in the development of verge gardens and bush pockets & if so, how? Verge garden & bush pocket establishment & maintanence are the responsibility of a designated Verge Garden crew with support from the garden staff all of which are members to the Parks & Streetscape Section. Consultation & identification of verge garden sites is undertaken by the Sustainable Streets Officer in Parks & Streetscape. 19. What plans are there for a National Tree Day Council event in Sunday July 28th or on School National Tree Day on Friday July 26. National Tree Day: Sunday 28 July 2013 10.30am- 1pm. This years site is at Wave Rock by the Cooks River at Marrickville Golf Course. We will be creating an important link in the river’s biodiversity corridor by planting a diverse range of shrubs, grasses & groundcovers from the sandstone heath & floodplain forest vegetation communities around the sandstone outcrop by the river. Each year up to 1,000 plants are planted and over 50 volunteers are part of the event given. This site is connected to a larger extension area which will be planted out by contractors & volunteers the week following National Tree Day. School National Tree Day: Friday 26 July. Each year the Community Nursery offers free plants to schools & early learning centres for planting either on Schools National Tree Day or another more suitable time during the year. Each year up to 10 schools take up the offer. 20. Has Council pursued opportunities to increase the urban forest canopy on State Govt & “Not for Profit” organizations land such as churches, schools by establishing contact with relevant land owners for this purpose? (provide details). To date Council has liaised with 3 schools in the area to encourage proactive tree management & planting. As part of the current tree planting program Dulwich Hill High School & Camdenville Public School have received mature (45L) tree donations. 21. What provisions are there in current Council planning instruments to encourage or require private land owners to plant trees &/or plant natives? 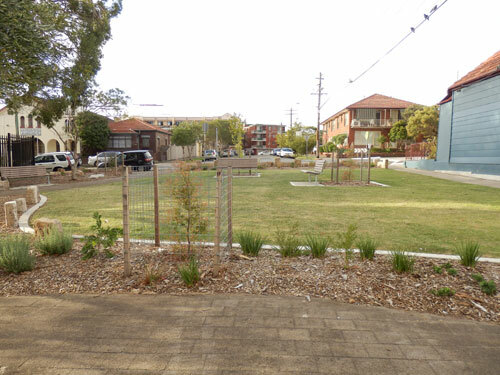 Section 2.18 – “Landscaping & Open Spaces” of the Marrickville Development Control Plan 2011 (DCP) specifies Council’s landscaping & open space requirements for development applications. The chapter outlines how landscaped areas should be designed in a way that minimizes stormwater run-off & improves appearance & amenity of a site through landscape design. These provisions encourage land owners to use pervious surfaces including the planting of trees. Compensatory planting requirements are enforced through our LEP & DCP DA & Permit tree removal approvals systems. In regards to encouraging the use of native species, on page 11 of Section 2.18 Council provides advisory notes that encourage land owners to use native species. Section 2.18.12 Advisory notes states; Applicants are encourages to: 1. Use native deciduous trees with large canopies, climbers & shrubs on the northern side of buildings. Additionally on page 11 of this section, an extensive list of preferred native tree species is provided. The table outlines the botanical name, common name & where the species is most suitable for planting within the LGA. 22. Has Council enforced any compensatory planting on private land in relation to where a tree has been removed, & a new planting is required in its place? (provide details, including how new planting requirements are monitored). Yes, where appropriate, the removal of a tree on private land will require a compensatory tree planting to be provided. I thank Clr Ellsmore for asking these questions. It’s been a long time since such comprehensive information on this subject was available to the community. 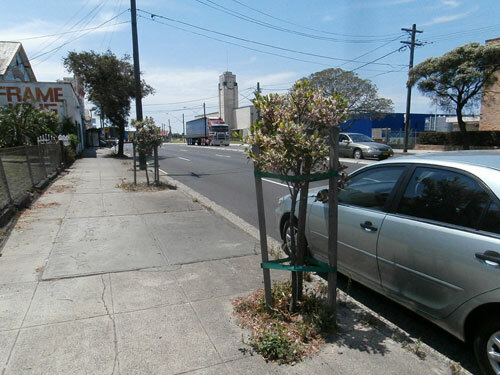 New street tree were planted along both sides of Calvert Street Marrickville in June 2012. Note that none of the trees are taller than the stakes that support them. Planted late 2012 in Dulwich Hill. Planted in Tempe. Photo taken in 2012. Planted around 3-years ago in Marrickville. Screenshot of the interactive map of Central Park. Link below. Today I drove through the city to Darlinghurst. As I don’t get to the CBD often, my drive through the city held a number of surprises. Unfortunately, I didn’t take my camera with me. My apologies to those who see these things every day. First, there is a major high-rise building being built at the new Central Park complex at Broadway. It looks to be the first building of the residential section called One Central Park. What grabbed my attention were the green walls that are being planted & even at this early stage one can see that they are going to be fantastic. As we took the turn into Pitt Street towards Eddy Avenue, the view down George Street was of tall green trees & shade everywhere. It really surprised me. I used to work at this end of George Street & the transformation is incredible. My first thought was that the major arterial road in the CBD could be lined with tall street trees, yet we can’t have the same across suburban Marrickville LGA? 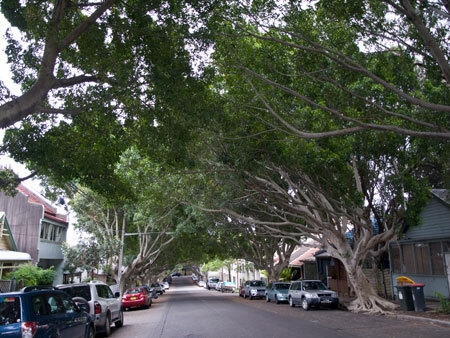 Oxford Street in Darlinghurst was also filled with tall leafy street trees. There were also massive pots of red Begonias hanging from smart poles giving a wonderful burst of colour wherever you looked. Taylor Square has a large water fountain. Don’t tell me it happened 10-years ago. It is now a very colourful pedestrian plaza & looks great. 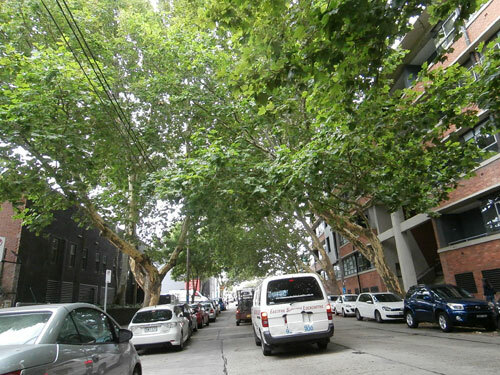 We parked in Darlinghurst & noted the large street trees everywhere. Being a boiling hot day it was pleasant to be out on the street as shade covered much of the footpaths as well as the road itself. Canopy is not token here. The street trees cascade over the road & are planted close enough so that their canopy links with the street trees next to them. It’s visually very beautiful. All street trees were surrounded by a permeable bitumen surface. This would prevent any tripping in such a high pedestrian traffic area, but also not create a space for litter to collect. So I drove away from leafy Sydney into Marrickville LGA. I have long noticed the differences in canopy between the suburbs of our municipality & between the municipalities that border us. As the City of Sydney increases their canopy a further 50%, the differences between us will be stark & no longer something people will ignore or I think even accept. This is the canopy of McEvoy Street Alexandria. I think it looks wonderful. This street just off King Street South caught my attention because it has short street trees on the side of the powerlines & tall Eucalypts on the other where there are no powerlines. This is not something I see often. Apologies. This is a long post, but I believe the issue is important. From memory the debate for this item lasted around 3-hours. This was the Council Meeting. Absent: Clr Gardener. The following is how I understood the meeting & all mistakes are mine. Note: MC = Marrickville Council. The Councillors & Wards are as follows – LABOR: Iskandar/Central, Haylen/North, Tsardoulias/West, Woods/South. GREENS: Phillips/Central, Ellsmore/North, Brooks/West, Leary/South. LIBERALS: Gardener/North, Tyler/West INDEPENDENT: Macri/Central, Hanna/South. advise & clearly enunciate any changes to the policies & controls governing tree management within the Marrickville Local Government Area. There were 10 speakers (including myself) against the recommendation & 1 speaker for the recommendation. For brevity I will outline the issues discussed rather than each speech. The report was described as draconian, shocking, contentious, preposterous & something that inflamed the community. Issues raised were – Removing street trees fails to acknowledge the value of the tree to the urban environment. The report does not look at other options & other technologies to deal with roots other than tree removal. There was no community consultation. The assessment of public infrastructure is that concrete will win over street trees. Education & consultation needs to happen & this needs to be done street by street. Questioned why community consultation is to happen 10-months after tonight’s decision. 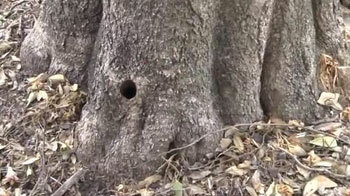 Size of tree hole needs to be looked at. There is a need for peer review of the report. There is an inequity of our urban forest compared with other Councils around Sydney. Exorbitant cost ($1,000) to plant a sapling. Climate change & the importance of trees to create a livable environment. Losing older, taller trees that are the very things that make our environment pleasant. Changing community attitudes recognize the value & importance of the urban forest. Contradictory elements in this report compared to the Urban Forest Policy. Council failed to consult with the Environment Committee. The removal of 3,960 trees will leave an enormous hole in the urban forest. The high loss of newly planted trees. Planting new trees over the tree roots of the removed tree, thereby setting the new tree up for failure. The large trees will be lost. We are beset by pollution & need all the help from trees we can get. We do recognise problems with trip hazards & that there are dying & dead trees that need to be removed. Concerned that trees will be removed without the opportunity for the community to comment. Trees should be marked for possible removal with the community given 1-month to comment. Section 5.9 of the LEP sets out the policy of how trees are managed & removed. The LEP has the force of the law. Clause 4 clearly states the requirement for community consultation. There is a huge contrast with the City of Sydney who are increasing their urban forest. They have doubled their trees & want to double this again. Lack of shade increases the Urban Heat Island Effect. Lack of aesthetics results in increased rates of violence in the community. MC’s Urban Forest Policy is more a ‘vision’ & if the recommendation is approved it will be a step in the wrong direction. MC has already adopted water-sensitive designs. Replacing impermeable surfaces with permeable surfaces is a better solution. The Urban Habitat Mosaic is important & concrete can be replaced with an understory. There can be mini-raingardens that water street trees & filter water before it gets to the Cooks River & this will save MC money on watering. MC should involve the community in planting as giving us ownership of trees will lower bills. This is a blanket approval to cut down trees. Only 1 person’s wage per year is being spent on maintaining newly planted trees – no wonder they die. Replacement trees are not canopy trees. We are planting too small & too few species. Trees are not maintained. We are in for a 4-degree rise in temperature & heat waves are predicted. On a recent 41-degree day, thousands of trees died. Bitumen becomes a heat trap. Humans need to keep cool. 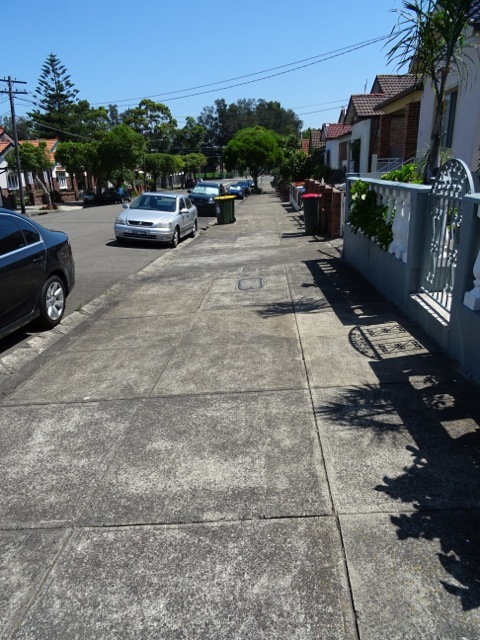 Trees prolong the life of house paint & concrete footpaths. Would MC be legally liable for the loss of property values? The recommendation is in strong contrast to every MC survey, which advocates for more trees. MC should respect trees & not see them as liabilities. They should show vision & best practice for large trees that are more robust than short trees. Big trees are carbon stores & lower the Heat Island Effect. A tree should only be removed after all avenues have been explored & only after consultation with the community. And finally this gem – The Urban Forest Policy says that 42,500 trees had been planted. The Tree Inventory said there were 22,608 street trees – so where are the other 47% of missing trees? Only half the trees that have been planted have survived. The speaker for the recommendations spoke about the following issues – Safety is a big issue. Hard to navigate a wheelchair safely around & over roots & people often need to go onto the road. I have 600mmm access for the wheelchair. MC wants us to get reports that cost thousands of dollars if we want a tree removed that is causing property damage. It should be easier & cheaper for people to have trees removed. The new trees on my street did grow. Tall trees are not stable. The first priority is safety. We need to get the balance right. Clr Tsardoulias: Moved the motion, but delete point 3. 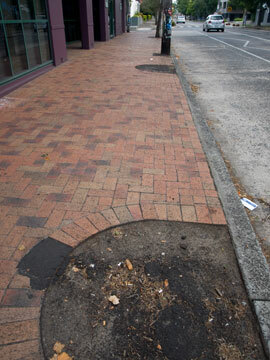 MC staff should look at porous & flexible pavement & stop using asphalt to repair footpaths next to trees. The main issues are serious trip hazards. There is a large incidence of liability over people tripping on our footpaths. Verge gardens are increased. Staff needs direction. If a tree is ready to collapse, staff should do something about this. We need to balance the issues with growing a canopy, maintaining trees & minimizing trip hazards. We need to trim trees & take action when there is an issue between the tree & footpath. Clr Hanna: If I am going to fix trees in Silver Street then I want to talk to residents of that street. I want to consult with the people living in that street. Clr Tsardoulias: We should talk to all the residents around the tree & plant the right tree or 2 or 3 trees. We have a significant problem & need to do a lot – asap. Clr Phillips: I’m quite horrified with the recommendations to take a chainsaw to the numbers of trees & that concrete has priority. It’s not with current community attitudes & our own guidelines. It looks at trees as liabilities, not as assets. Large, older trees, particularly Eucalypts will be the trees removed & they are giving a huge impact on the LGA. Pulling out the Eucalypts will change the Australian look to the LGA. We haven’t peer reviewed, sent the report to the Environment Committee or had community consultation, yet we are giving such a strong recommendation. The Street Tree Masterplan is a great idea, a more holistic view & it’s what MC & community needs about removing trees. To make major changes to our other tree policies should require community consultation. Moved amendments – MC refers report to the Environment Committee & this audit be peer reviewed. Maintenance should be included in the $170,000 budget. MC defers any non-urgent work until the Street Tree Masterplan has been adopted. Mayor Macri: We are talking about removing 98 trees at a cost of $170,000. The rest is renewal within 4-5 years & part of the Street Tree Masterplan. We are voting on 98 trees now. MC self-insures. Trees have been identified as a risk & MC must protect itself. MC spends $23 per tree per year. We have to remove trees. We want to gain canopy. 117 trees are dead. 18% are poor structure. 70% are mature. We have to take a balanced approach & we need to start from the beginning. We have never done it this way. We can’t take an alarmist approach. Once the concrete comes up, that’s the best time to see the roots & sometimes they need to be chopped off. Clr Ellsmore: There were more than 250 submissions in a petition in under 24-hours. Serious questions have been raised by the community. 80% of trees in my street have cracked the pavement. It is important to remember than the community has gone through a long period of community consultation. Why has the report not been sent to the Environment Committee? Everyone wants a Street Tree Masterplan & have community engagement. Clr Haylen: We need to take the safety of our residents, which is a genuine concern. Clr Tsardoulias’s amendment, when we are renewing an entire street, the Urban Forest Policy provides the guidelines whether that tree stays. Repair footpath every 2-years or every 10-years? Trees make our place a better place to live. I don’t support a further review. It’s an audit. Next step is a Street Tree Masterplan. Let’s find those vacant spots. Clr Hanna: If the Director was here he would tell you how many people fall on the footpath. We have a lot of older people. Safety comes first. Trees come last. Clr Leary: Staff need to look at other pavement options, stop using asphalt & consult with residents over verge gardens. Staff also needs to consult with residents of affected streets. (These were incorporated into the amendment.) Clr Tsardoulias: We want to grow & balance services. Fixing cracked footpaths & planting the right trees in the right place. Receive & note the report. Refer the report to the Environment Committee. Provide a capital budget of $170,000 in 2013/14 for street tree removal & replacement. Where capital renewal reconstruction works are undertaken & conflict exists between a street tree & infrastructure, the guidelines outlined in the Urban Forest Strategy should be followed. Advise & clearly enunciate any changes to the policies & controls governing tree management within Marrickville LGA. Council staff look at other paving options, including porous flexible paving & that staff stop using asphalt for reconstruction of pavements. Council staff look at options to increase the number of verge gardens & sustainable gardens. Consult with the residents of the streets affected. Defer any non-urgent actions arising from the report until the Street Tree Master Plan is completed & adopted & a thorough community consultation is completed. Vote – unanimous. Motion Carried. 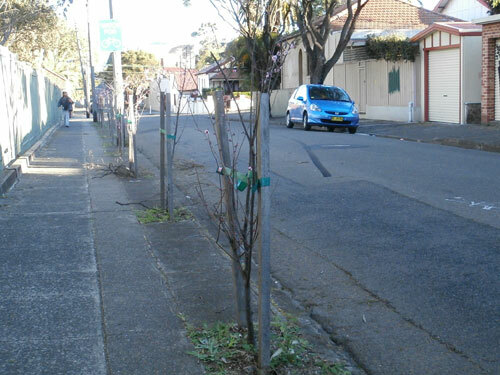 These street trees along Petersham Road Marrickville are at least 2-years old. The photo was taken last winter when they had no leaves. I think the verges around the street trees in Despointes Street in Marrickville look quite good. Another street in Marrickville where someone is trying to add beauty by creating a verge garden. Note the lack of & short stature of the street trees. What a gorgeous street. 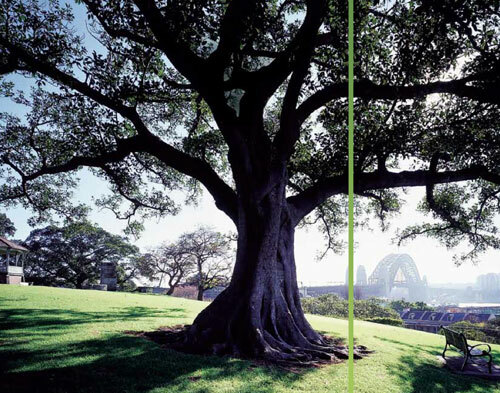 Photo comes from the Greening Sydney document by City of Sydney Council. I found the following about the ‘Green Sydney Plan’ on the City of Sydney Council’s Green Villages website – http://bit.ly/OBZsMy Sydney Council plans to increase the tree canopy cover by a whopping 50% by 2030 as well as create wildlife corridors using locally-indigenous plant species. 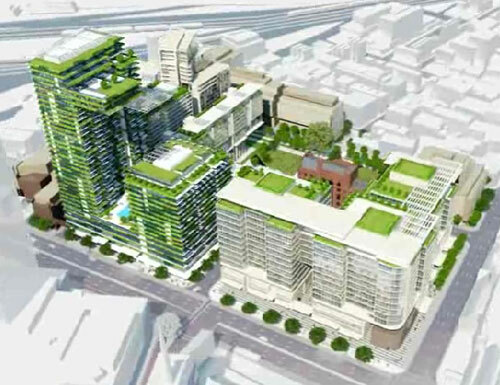 They also plan to create more green walls & verge gardens to deal with stormwater runoff as well as collaborate with property owners to create green walls & green roofs. 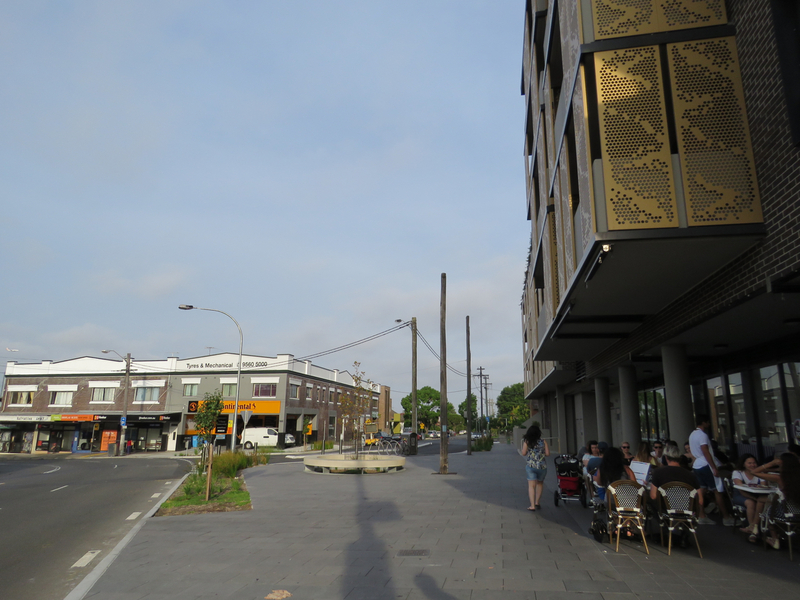 I was sad that green walls & roofs were not included in Marrickville’s newly completed LEP. I myself heard an Architect at a meeting of the Joint Regional Planning Panel answer a question from the panel as to why green features such as walls & roofs was not included in the design. His answer was that the LEP did not require him to look at this, so he didn’t. This showed me that, for the most part, Architects will not start to incorporate these kinds of green features in their designs until this becomes a requirement (to at least look at incorporating them). With so much development coming our way across Marrickville LGA, I fear that we will have developments approved that are less than what they could be to take us into the next 60 years where the climate is expected to be very different. Attributes like green walls & green roofs have so many benefits & would definitely help make life easier & cheaper for people residing in them as well as being great for the environment. City of Sydney Council have developed a Footpath Gardening Policy which will allow “residents & businesses to place a planter box on a public footpath, or establish a garden on a verge or nature strip without a development application, subject to safety & access.” Marrickville Council has done the same with verge gardens, but not planter boxes as far as I am aware. Hopefully businesses will catch on that a pretty frontage created just by installing a planter box filled with greenery or seasonal flowers will pay them back in increased patronage. The interest in verge gardens by residents is growing with the recognition that the streetscape can benefit from greening & beautification, as well as wasted land being used for growing purposes. 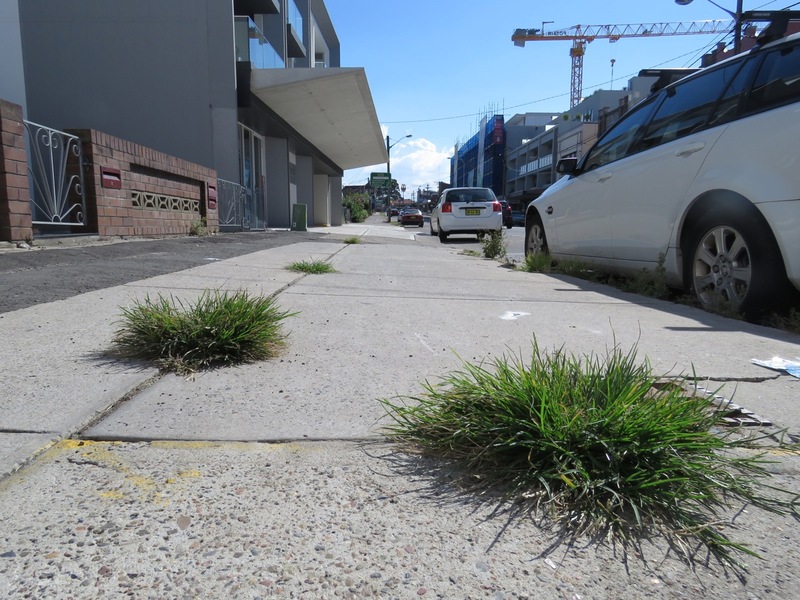 The ‘Sustainable Streets’ initiative in Chippendale is moving at great knots & motivating a lot of people by showing that it can be done & that it is a great way to bring the community together. I will post an update on their developments soon. One other thing Sydney Council mentioned was including the community in a range of ways, including ‘junior rangers.’ I’m not sure what this means, but if it means people looking after parks & talking to people about not trashing the place with litter & all the other antisocial behaviour that impacts heavily on other park users & the environment such as what I have been posting about that occurs routinely in Tempe Reserve, then this will be a fantastic initiative. Sydney Lord Mayor Clover Moore says, “Having high-quality open space is very important for the health & happiness of our community. We know that trees & other plantings help absorb carbon pollution & help cool our city. Well landscaped streets also provide more enjoyable spaces for the local community & support local businesses & retailers by making our villages’ attractive destinations.” She’s got that right. A view of the Sydney Harbour Bridge from behind one of the City of Sydney’s glorious Fig trees. It’s great that Sydney Council has not stopped planting Fig trees as they are such a statement tree, loved by most people & offer habitat & food for urban wildlife. 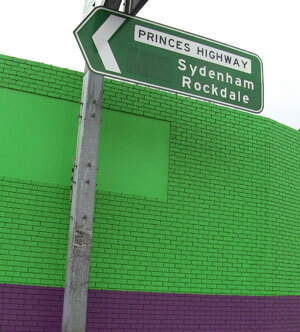 Photo comes from the Greening Sydney document by City of Sydney Council. 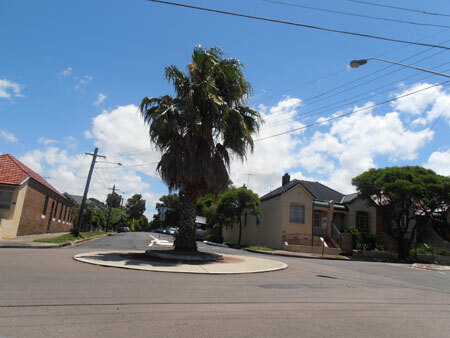 I really hope that street trees like this are not counted as real trees in Marrickville Council’s Street Tree Inventory. It is one of many that have been kept pruned by the community. It would be unfair for these trees to be counted as part of the urban forest when they actually provide very little in terms of benefit. I took this photo early May 2012. In my opinion areas like Sydney’s North Shore can cope with deciduous street trees because when they lose their leaves the streetscape is not laid bare for 5-6 months of the year. Autumn across great areas of Marrickville LGA means a fabulous 3 weeks of colour, then many months with the predominant aspect of the streetscape being buildings & other hard surfaces. For me, the lack of green street trees in winter means that the landscape becomes harsh. Marrickville Road shopping strip is a good example. A harsh landscape tends to make winter feel colder for me. Anyway, it’s all personal preference. 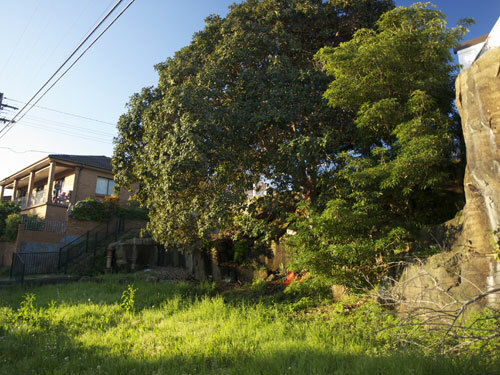 The Marrickville Urban Forest update returned to the Council Meeting last Tuesday. I did not attend. 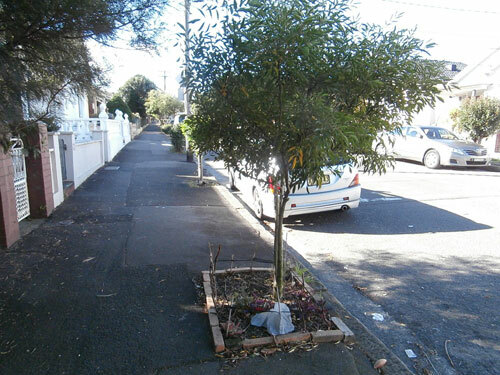 Marrickville Council’s paper said, “There are approximately 22,000 street trees in the Marrickville Council area. In the current 2011/12 financial year, tree planting consists of 80 street trees & 12 park trees funded from the Capital Budget and up to 430 street trees are expected to be planted with funding from the Operating Budget subject to weather conditions.” Total – 512 trees. “4 out of the 7 councils had a holistic concept of all urban tree assets, both public & private, (such as an urban forest) that had been endorsed by the Council as part of its strategic tree management. 5 out of the 7 councils had measured the extent of all urban forest canopy (both public and private). – City of Sydney Council is developing a draft policy, includes targets for 2030 & 2050. 3 out of the 7 councils provided specific funding to achieve increased urban forest canopy (over & above normal maintenance & replacement planting). 3 out of the 7 councils have a comprehensive asset condition register for all trees maintained by Council. I was told that there was debate with some of the Councillors giving examples of people not liking street trees & the mess they create. I’d say this dislike of street trees is higher at this time of the year because of the Council’s preference to plant deciduous street trees. All you need to do is drive around to see just how many Prunus varieties & other deciduous trees there are. If you consider fallen leaves messy, then many parts of the LGA are looking dreadful at the moment. Me – I love fallen leaves & think they are quite beautiful. I also would have no problem sweeping leaves out on the footpath without feeling that this is a job for Council to do, but I know many think this is only Council’s responsibility. The report was noted, so the issue will return in the future, which is great because this is the only way we get comprehensive information about the urban forest. 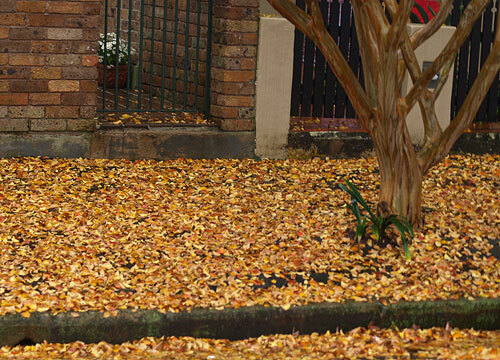 Autumn leaves in Camperdown – I think this is pretty, but many hate it. Last week I spotted something interesting that Pittwater Council is doing to improve the visual outlook of the municipality. Having long disliked buildings that are painted in garish colours like lime green, bright yellow, bright red or even striped in an attempt to make the business more noticeable & perhaps trademark it, I think what Pittwater Council are doing is quite revolutionary as they are doing this with trees. As part of their ‘Tree Replenishment Program’ aimed at increasing the tree canopy, Pittwater Council have said that the Leightons Cypress Pine is an undesirable species & are encouraging residents not to plant it. Instead they give free advice to residents on what plants & trees are suitable & grow well in their area. They also have a ‘Scenic Streets Register’ made up of pretty streets that have been chosen by local residents. This is such a great way to get the community connecting with their environment & thinking about how street trees can make or break the visual outlook of a street. It would be great if our own Marrickville Council could do both their own version of the tree replenishment & the scenic streets programs. This traffic island in Stanmore is unusual as not many have trees planted in them. It looks great. 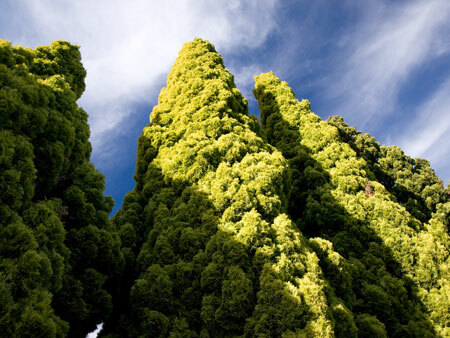 The City of Melbourne’s urban forest comprises of 60,000 public trees & 20,000 private trees. Unfortunately, the city will lose 44% of its trees within 20 years because their trees are aging. Climate change is also having an impact on Melbourne’s urban forest, which has just experienced 10 years of drought & high temperatures. To mitigate this the City of Melbourne are planting a range of tree species that will better cope with global warming now so there will be an urban forest in 20 years time to provide food & habitat for urban wildlife as well as all the health benefits trees provide to the community. Although Marrickville Council replaced the street trees in 2 of these purpose built holes in Bridge Street Stanmore last year, there are still 2 which remain empty. The current percentage of canopy cover of public trees is 22%. Melbourne City Council aims to increase this to 40% using large canopy trees. The Council plans to plant no more than 5% of one species, 10% of any genus & 20% of one family. Melbourne Urban Forest Strategy is described as a ‘legacy document’ & the Council are inviting & encouraging the community to be involved in the planning & decision-making of which species of public trees will be planted in their precinct. There is nothing to stop Marrickville Council doing the same thing, except a willingness to prioritize the urban forest & spend the money needed to achieve this. If the canopy cover isn’t increased significantly in the near future, I don’t believe that we will fare well when our municipality gets hotter. I love what the City of Melbourne is doing. I love their attitude & respect for the urban forest. I love that they are including the community & want them to have a say in how their streets will look in the future for their children & their children’s children. I really love that the urban forest will increase by almost 100%. It’s going to be so beautiful. I love that global warming is being factored in to the Council’s decision-making. Lastly, I love that this is all planned & there is nothing hotchpotch about it. Melbourne’s public trees are spectacular. With a graduated system of removal & replacement, plus the planting of many thousands of extra trees, this city will continue to be a green jewel in our land. For years when driving along Salisbury Road I have thought I must stop & have a look at this beautiful street. I never have. Recently I was walking in Camperdown Memorial Rest Park & instead of putting my attention towards the church wall, steeple & canopy of trees within the church grounds as usual, I looked the other way & between the boundary trees, saw a street full of Hill’s Figs. I realized that this was the other end of the street I had always meant to have a look at. 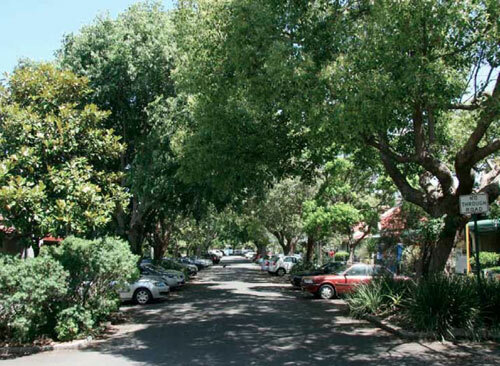 It is Northwood Street Camperdown, lined with beautiful mature Hill’s Fig trees that have created a gorgeous canopy over the street. It’s like walking through a green tunnel & reminds me very much of Laman Street Newcastle. Northwood Street is peaceful, shady, cool & filled with birds so it sounds nice too. I would guess the age of the trees to be around 80-years-old. It looks like over the years some trees have been lost, but the overall feel remains. Ausgrid (the new name for Energy Australia) have done something wonderful by putting up aerial bundled cabling eliminating the need to do any further pruning for power lines. This was especially nice to see as it is recognizing the history & value of these street trees. The article lists where now historic Figs were planted around Sydney as well as in Wauchope, Sawtell & Newcastle & also mentions the mature Hills Figs that were removed last year from Wahroonga Railway Station much to the community’s dismay. The main section of the article speaks about the median avenue of Hill’s Fig trees in Hastings Street Wauchope planted in 1938. “Over the years 2007-2010 there has been an active public campaign to protect these against proposals to remove them due to complaints of damage by roots to plumbing on adjacent properties also because of invasive roots causing trip hazards, dislodging paths & walls. 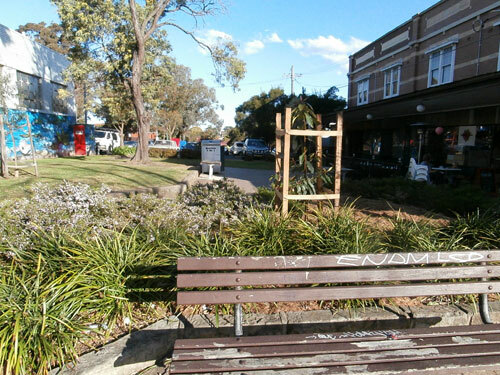 Wauchope received a wonderful christmas present when Hastings Valley Council decided to preserve the trees in the block from Young to Bain Streets.” To fix the problems the Council installed a root barrier & planted gardens underneath the trees. The before & after photos show a profound difference & illustrate the benefits of retaining these trees for the streetscape. Unfortunately, at the time of writing the Laman Street Figs were thought to be safe from the axe. Not so, as the strong community opposition to Newcastle City Council’s decision to proceed with removing these trees continues. 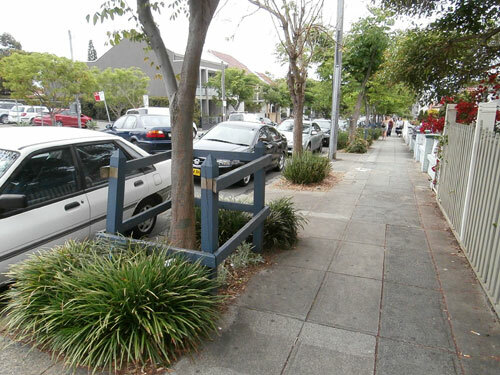 In amongst this great article, the street trees of Northwood Street Camperdown rated a mention. 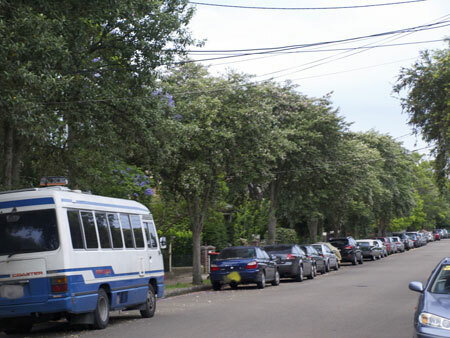 “Northwood Street Camperdown is another example of an avenue of Hills figs under pressure of removal, thwarted so far only by vigorous resident opposition.” It was very nice to read that the residents have stopped the removal of these trees. Northwood Street residents have benefited from these trees by raised property values, much beauty & wildlife & lower bills for cooling. It’s worth a stroll down Northwood Street. I should have stopped here years ago. I feel it is a shame we can’t have more of these trees planted in appropriate places around Marrickville LGA. We do have a few suitable places that remain as barren areas. A large canopy tree in these locations would improve the streetscape dramatically & add much needed green to the skyline. Planting a Hill’s Fig or two in the vast areas of lawn in some of our parks would also be beneficial as the trees would provide shade & beauty. Most people love large Fig trees & because they live so long, they become part of the community’s history. 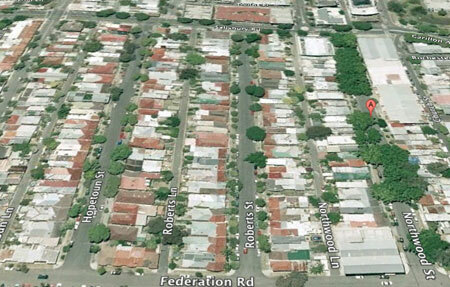 Google Earth map of Camperdown showing the difference between the canopy of Northwood Street & the surrounding area. 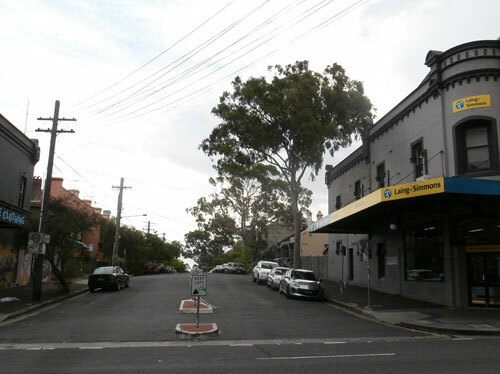 The street trees make this area in the image quite leafy compared to many areas across Marrickville LGA. Showing a part of Harrow Road Stanmore. Marrickville Council has recommended removing 24 (or 27) street trees & replacing with exotics that have no benefit to wildlife. This was the Council Meeting. Absent: Clrs Phillips, Peters & Iskandar. The following is how I understood the meeting & all mistakes are mine. Note: MC = Marrickville Council. People have requested that I identify which ward each Councillor is in & whether they are Labor, Green or Independent. To keep the size of the post as short as I can I will write this at the top of these posts. LABOR: Iskandar/Central, Wright//North, Tsardoulias/West, O’Sullivan/South. GREENS: Phillips/Central, Peters/North, Byrnes/North, Kontellis/West, Olive/South. INDEPENDENT: Macri/Central, Thanos/West, Hanna/South. 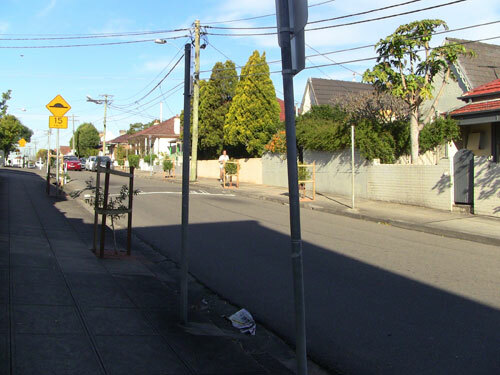 Item 5: Resident petition to remove & replace Norfolk Island Hibiscus street trees in Harrow Road Stanmore – Council staff recommending removal & replacement of 24 street trees in 2 stages, 5 years apart & to replace with a single species of exotic deciduous trees. [There are actually 27 of this species of tree in Harrow Road]. One resident spoke: Said she had a 50 ft high Jacaranda & Fig in neighbour’s gardens that drop litter in her yard all year round. MC got their count wrong; actually 27 trees. 23 households signed, but 70 households in Harrow Road. Spoke to a resident in Harrow Road who was not aware of this & was very distressed. Asked that all the residents be notified & have a meeting with Council staff. We all need to care for the environment & MC recently adopted their Biodiversity Strategy. I saw only 5 trees with bugs & saw parrots & 2 other bird species. The trees probably provide food for flying foxes & micro-bats. There had only been a handful of complaints in 10 years with most only asking MC to prune & sweep the footpath. We don’t know what the petition says. My mother used to tell me not to touch prickly seeds, caterpillars, bugs or walk on bindi-eye & then walk in the house with my shoes on. [The list was long & I didn’t not manage to write all the examples down]. No medical evidence or evidence about the house was provided in the report. I saw no bugs on letterboxes or bins, only on some of the trees . Is this a reason to take out 27 trees? Leaf litter is the responsibility of MC, not to chop down all the trees. I’ve asked the media to report on this to inform the community of this outrageous proposal. [She spoke about a decision from the Land & Environment Court that said residents have a responsibility to clean up & dispose of litter themselves]. MC has the responsibility to prune trees. I don’t think there is a case to remove these trees. The trees outside house numbers 40,42 & 46 look like they have been poisoned. Look in the forks of the trees & see if there are drill holes. One has a huge drill hole at the base. This is outrageous. These trees belong to us; the whole community. MC shouldn’t be removing street trees because of these issues. Clr Thanos: Moved the recommendation. MC’s responsibility is to clean litter on streets, not in front gardens. This is a public health problem because of skin irritations. I’d hate to see a child die as a result. Staff are moving to prevent this. The excessive litter is a massive impost on the residents. If we want to manage the trees we will have to nuke because of the bugs. Clr Olive: Foreshadowed motion: MC to write to residents asking if they would like their tree replaced. The trees taken out in stages doesn’t seem to relate to the complainants. It’s better to go to the complainants & ask them. We should replace with Jacarandas & not take out these trees unnecessarily from residents who may not be bothered. There are plenty of this species across the LGA. This tree does not have a history of causing medical reactions to people. Clr O’Sullivan: I would support Clr Olive’s suggestion. These trees are quite prolific across Marrickville LGA. They are medium-sized trees appropriate for under overhead wires & attract large amounts of nectar-feeding birds. MC just endorsed the Biodiversity Plan, so should keep this in mind. I am also aware of the Land & Environment Court who laid down principles in relation to removal of trees because of leaf litter & fruit. Clr Olive’s suggestion is practical & cautious. The replacement trees should fit in with our biodiversity strategy & we should plant native trees. Jacarandas shed large amounts of flowers & leaves. It is worthwhile for our MC experts to do some hard thinking about this; trees that will allow sunlight through, but not necessarily deciduous. is a real concern. It’s illegal & we should use the law. If our building was smashed we would call the police. I’d have some discomfort supporting Clr Olive’s foreshadowed motion, asking whether they want to remove their trees. These are not their trees. Clr Macri: I support the motion & support the staff. It’s not just about bugs, it’s about their quality of life if people have a fear or paranoia about bugs falling on them. A deciduous tree would offer more amenity & the new trees will be looked after the community instead poisoning them. This is their street, part of their life. Replace with suitable trees. We are running out of suitable places to plant trees. We are scratching our heads where to plant trees. Staff are trying to find place to plant the 500 trees each year. Trees are being planted on top each other. Consultation will happen once we vote. The recommendation is passed, the proposal is to remove the trees. We need to allow the process to continue. It’s not about sweeping up leaves. Clr Olive: Ask house numbers 4, 10, 40, 54, 56 & 64 if they want their trees replaced. Mayor Hanna: I don’t have the petition in front of me. If any residents want the trees removed, no one is here. I want to consult with the community. I will vote for Clr Olive’s motion just for consultation with the residents. If the residents really want it, I will vote for removal. 2 families of Cotton Harlequin Bugs outside 4 Harrow Road Stanmore. Only a small number of trees had visible bugs (5 trees were counted on the days I visited). 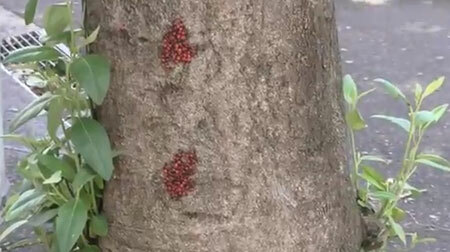 In my last post I showed a photo of a tree in Harrow Road with a large number of bugs on the trunk. This was unusual in this street. Most of the trees with bugs looked like this. Click to enlarge. Clr Thanos: MC will have to spray [the trees] yearly for the [Cotton Harlequin] bugs with chemicals that pose a health risk. What is more important, the health of the residents or the trees? I’m disgusted that MC will put the residents at risk. These trees pose a health risk. We can’t delay. We should be consulting with the residents at least on today’s proposal. MC is removing the trees, but will be consulting with the residents. If the residents feel that strongly that the trees should be kept, then MC will reverse the decision. The Act is clear – when the tree is a nuisance, we should remove the trees. Vote Clr Thanos’s motion: For – Clrs Thanos, Tsardoulias & Macri. Against: Clrs Wright, O’Sullivan, Olive, Kontellis & Byrne. Lost. Clr Olive: Mine is a sensible low-impact way. [He mentioned once living with this species of tree in his garden.] I’ve never had any bug problems. They also have needles. I just decided not to rub them into my skin. Clr O’Sullivan: We need to target specific people in the street. We have thousands of these trees in the LGA & if we start to act on their alleged health risk, we are opening up a can of worms. We are opening up to community hysteria. Let’s look at the specific people & if they want their trees removed, fine. Amendment: Replacement trees should be natives consistent with MC’s Biodiversity Strategy. This was absorbed into Clr Olive’s motion. Clr Kontellis: I am against chopping down 27 trees. I’d like to write to people & mention we condemn poisoning & that we will be prosecuting. We should be increasing the street cleaning for Harrow Road. Removing the trees should be the last & I include Clr O’Sullivan’s native trees. We need to say that removing trees is the absolute last option. Staff: Regarding street cleaning in Harrow Road – We sweep every 3 weeks in summer, every 8 weeks in winter. We struggle to reach this. [He said something about doing more street sweeping here will take this service away from other streets]. Clr Olive: I didn’t absorb Clr Kontellis’s foreshadowed motion because it broadens to all residents in the street, whereas mine concerns those who want their trees removed. I lament chopping down these mature trees. Vote Clr Kontellis’s motion: For: Clrs Kontellis & Byrne. Against: Clrs Olive, Tsardoulias, Wright, O’Sullivan, Hanna & Macri. Lost. Vote for Clr Olive’s motion: Against Clr Thanos. For: Clrs Olive, Tsardoulias, Wright, O’Sullivan, Kontellis, Byrne, Macri & Hanna. Carried. I last wrote about this issue here – https://savingourtrees.wordpress.com/2011/12/03/public-tree-removals-in-stanmore/ Here ends part 1. In last week's Inner West Courier newspaper, Council published this information about increased street cleaning for Marrickville LGA. Click to enlarge.